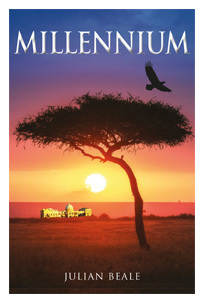 Millennium is a fast moving story of our time. Fact blurs with fiction as a terrifying drama unfolds. A shadowy terrorist sect with a thousand years of history is preparing a devastating, simultaneous assault on the world’s most populous and famous cities. Only one man can confront the threat and he must depend on the help of his lover and their friends in London and in Century City, capital of the newly-established African republic of Millennium. Tension increases with the struggle against an unknown agenda and uncertain timeline. The action races towards a climax in the wild bushland of Africa, deep in a country which was born on the first day of the century, described in the author’s companion novel, Wings of the Morning. Julian Beale is the author of Wings of the Morning, a powerful thriller published by Umbria Press. He live near Chippping Camden, Cotswolds, Glos. Reviews, author promotion, facebook, twitter etc. Smiths featured Wings of the Morning as a selected title.